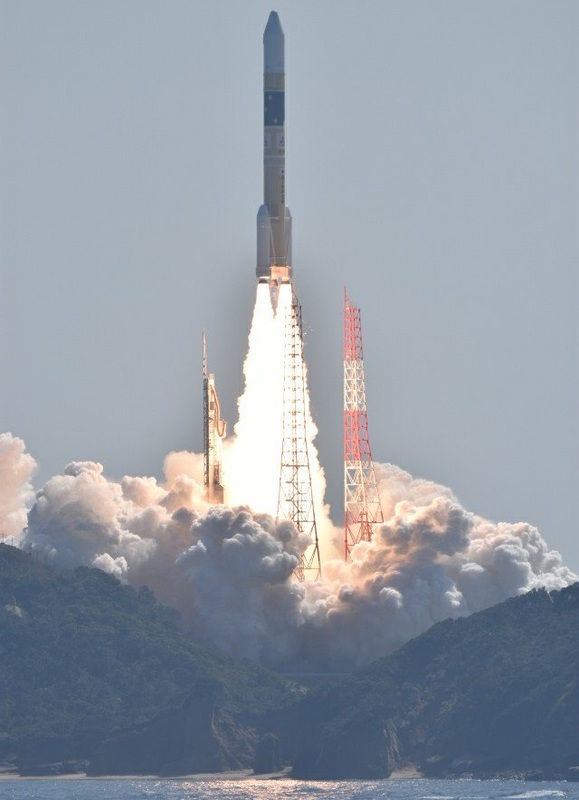 Blasting into clear skies over the Tanegashima Space Center, Japan’s H-IIA rocket embarked on a clandestine mission on Tuesday to launch the country’s next sharply-eyed optical reconnaissance craft flying under the Information Gathering Satellite Program. 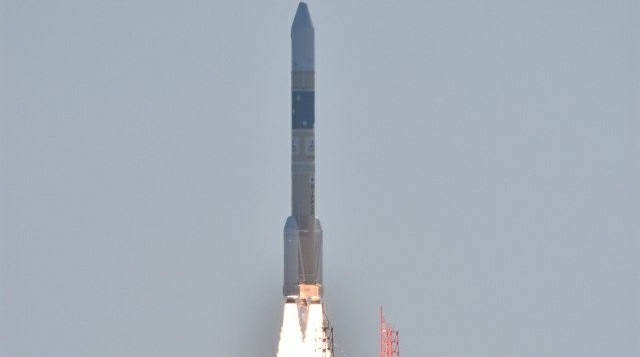 The IGS Optical 6 satellite, reportedly capable of achieving a ground resolution exceeding 40 centimeters, is the 16th mission flown under IGS to provide Japan with independent access to reconnaissance data, primarily used to assess potentially hostile activities in Japan’s geo-political neighborhood. Powered by a pair of Solid Rocket Boosters and cryogenic core stage, H-IIA leapt off its sea-side launch pad at 4:34 UTC on Tuesday, 1:34 p.m. local time, heading into an undisclosed orbit in a hush-hush mission conducted mostly out of public view as no live coverage of the flight was offered. Launch operator Mitsubishi Heavy Industries provided near real-time updates for those gathered at the launch site, confirming around 20 minutes after liftoff that the IGS Optical 6 satellite was deployed to the target orbit – expected to be a Sun Synchronous Orbit around 500 Kilometers in altitude from where the satellite can keep a watchful eye on activities going on anywhere across the globe. 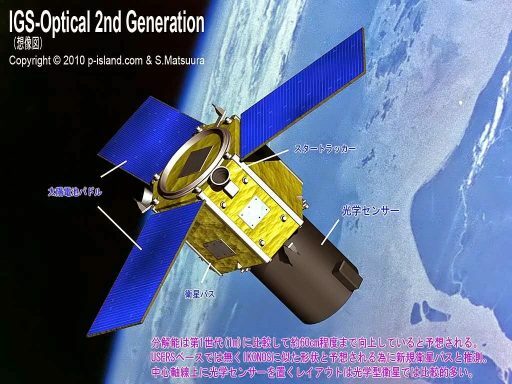 Japan initiated the Information Gathering Satellite (IGS) Program in 1998 as the country’s first space-based intelligence program to collect data over foreign territories to warn of any potential military threats in the Asia-Pacific Region. The program was in large part driven by the test launch of a North Korean Taepodong rocket that overflew the Japanese territory in 1998 in an apparent attempt to place an object into orbit using a modified intermediate-range ballistic missile. At that time, Japan lacked an independent space-based reconnaissance capability and had to purchase satellite intelligence products from the U.S., coming with a hefty price tag and relatively lengthy delivery times not suitable for real-time threat assessments. The Japanese Cabinet provided the green light for the development of a home-grown satellite intelligence capability in 1998 – only a decade after Japan launched its first Earth Observation mission to gain hands-on experience in a relatively complex field. 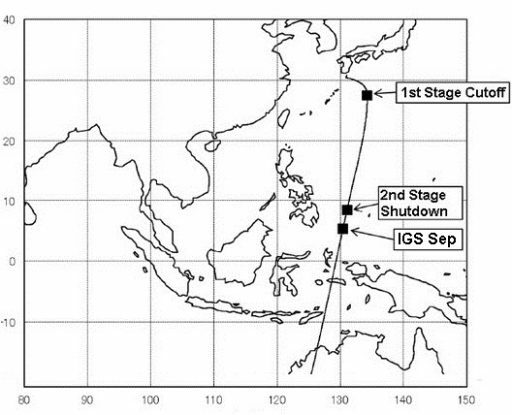 Given the geo-political situation in the Asia-Pacific Area, development of IGS proceeded on a fairly tight timeline of only five years between the formal initiation of the program and the initial launch in 2003, involving a pair of satellites riding into orbit atop the same H-IIA rocket. The two satellites, designated IGS-1A and 1B, included one optical-imaging craft with a ground resolution of one meter and a radar satellite capable of achieving a resolution better than three meters – combining the sharply-eyed vision of optical instruments with the all-weather, day-and-night imaging capabilities of a radar to create a robust system and ensure a steady flow of data products. 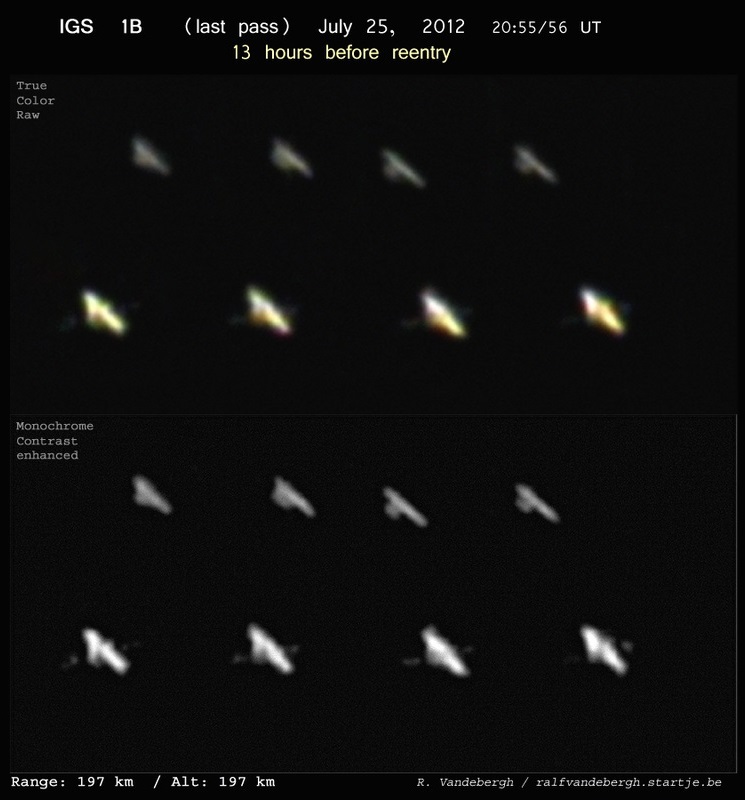 This photo series acquired by Astrophotographer Ralf Vandebergh shows IGS 1B in Orbit during its final hours before re-entry. Another pair of first-generation satellites launched later in 2003 but failed to achieve orbit due to an SRB separation failure on their H-IIA launch vehicle – the only failure of the H-IIA/B series to date. In the years that followed, IGS satellites went through a gradual evolution as their performance characteristics were improved – resulting in the optical satellites upgrading to sub-meter and eventual sub-50 cm ground resolution for panchromatic imagery and better than 3 meters for multi-band color imagery while the radar satellites also stepped up to one-meter resolution; the latest SAR mission reportedly achieves a ground resolution of 50 centimeters. Prior to Tuesday’s launch, IGS launched a total of 15 satellites, 13 of which successfully reached orbit and delivered data. Of the satellites launched before Tuesday, eight carried optical payloads and seven were outfitted with Synthetic Aperture Radars with the optical segment going through five generations while the SAR segment went through four large evolutionary steps. As of late 2017, Japanese media reports indicated that six IGS satellites remained in active operation: Optical Satellites 4 and 5 launched in 2011 and 2015 and four SAR satellites launched between 2011 and 2017. Per its initial requirements, IGS needs two optical and two radar satellites to be considered fully operational. The IGS Optical 6 satellite launched on Tuesday reportedly belongs to the 5th generation of optical satellites that was inaugurated in 2013 on the IGS 8B satellite that served as a pathfinder for the new technology and successfully operated for a two-year demonstration mission. Optical 5 was the first operational satellite of the improved fifth generation and has been in operation since 2015. 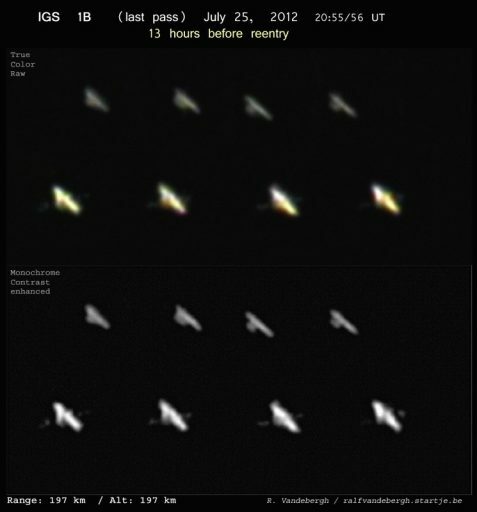 The 5th generation optical satellites are reportedly capable of delivering imagery at a ground resolution of 40 centimeters or better for panchromatic black-and-white imagery and better than two meters for multi-band color images and near-infrared data products – rivaling the most powerful commercial Earth-imaging satellites currently in operation. Improvements of the IGS system will continue over the coming years with plans of operating the constellation throughout the 2020s and adding a data relay system that could enable real-time tasking and data relay from the satellites instead of having to wait for ground station passes to retrieve intelligence data. For the near-term, IGS is planning the launch of Radar 6 later in 2018 and the successor to the 5th generation optical satellites is penciled in for launch in 2019 to implement further performance enhancements. 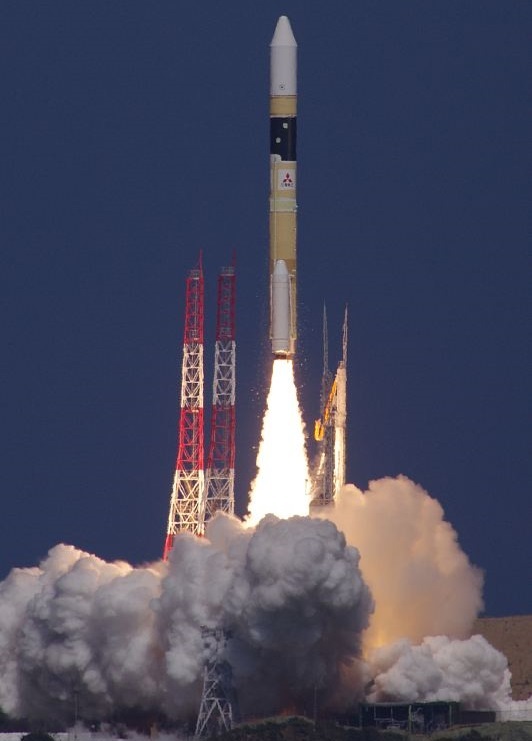 Tuesday’s launch marked the third Japanese space launch of the year, following up on the successful mission of the light-lift Epsilon rocket in January to lift the ASNARO-2 radar satellite and the launch of the world’s smallest orbital launch vehicle earlier this month, sending a 3U CubeSat into orbit. Per current manifest information, Japan is planning another two H-IIA missions in 2018, the launch of the more powerful H-IIB with the seventh HTV cargo spacecraft is expected in the summer and Epsilon has at least one more mission on its fiscal year 2018 schedule. Launches under the IGS Program are treated similarly to U.S. National Reconnaissance Office missions as Japan acknowledges the existence of the mission but does not share any operational details like the satellite’s capabilities and target orbit. No live launch broadcast was provided by official sources, but amateur broadcasters like NVS were on the scene to provide live views of the rocket’s liftoff and share any updates provided via the Range Control Center in real time. Called upon for the launch of IGS Optical 6 was the H-IIA 202 launch vehicle, employing a stack of two cryogenic rocket stage plus a pair of Solid Rocket Boosters for extra power during the first minute and a half of the mission. 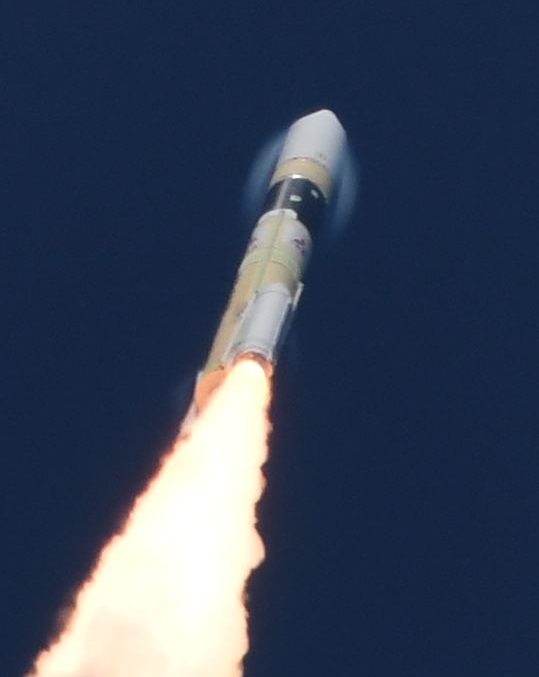 Tuesday’s launch marked the 38th flight of the H-IIA rocket series, the 24th in the 202 configuration. The 53-meter tall rocket came alive five seconds before liftoff when its LE-7A engine fired up to soar to a launch thrust of 86,000 Kilogram-force before the twin boosters lit up at the moment of T-0 – catapulting the vehicle skyward with an initial thrust of 575 metric-ton-force. Departing the picturesque Tanegashima Space Center, the typical scream of the H-IIA rocket was audible across the space center with the vehicle passing Mach 1 within a minute of liftoff and going through the area of Maximum Dynamic Pressure shortly thereafter as it made its way through the dense atmosphere. Navigational warnings issued for Tuesday’s mission showed the typical dogleg trajectory H-IIA has to fly when targeting a high-inclination orbit – flying a powered turn during its climb into orbit to avoid any rocket fragments coming down over the Philippines and frequented fishing areas. H-IIA pitched and rolled onto an initial heading to the south-east to drop the boosters and payload fairing before the core stage initiated a right-hand turn to align itself with a south-westerly flight path toward an orbital inclination around 97.4 degrees. Each of the twin boosters burned through 65 metric tons of propellants before thrust tailed off passing the T+100-second mark into the flight. Separation of the boosters was triggered at T+2 minutes when their chamber pressure was below a programmed threshold, falling away from the rocket after helping accelerate it to over 1.5 km/s. Following booster separation, the first stage was to continue powering the vehicle towards orbit with a thrust of 109,000 Kilogram-force, firing until around T+6 minutes and 36 seconds before handing off to the rocket’s second stage. The 14,000 Kilogram-force LE-5B engine of the second stage was to burn for a little over eight minutes to directly insert the satellite into its target orbit. Main Engine Cutoff was confirmed around 15 minutes after liftoff when the vehicle had reached orbital speed at an altitude of approximately 500 Kilometers. Range Control also provided confirmation of a successful separation of the IGS Optical 6 satellite around 20 minutes after launch. Per agreements between Japan and the U.S, no orbital tracking data of IGS satellites collected by U.S. space surveillance will be released to the public, but a worldwide network of satellite trackers will keep watch over the newly launched satellite, typically revealing its orbit within a period of days after launch.